Qns: Name one dessert that your hubby is nagging / pleading / demanding you to make for him for the past months! The last time I baked a cheesecake was more than a year ago and since then, my mister at home has never failed to remind me how much he is in love with my baked cheesecake and how rarely I bake for him lately. To be honest, he is not wrong. 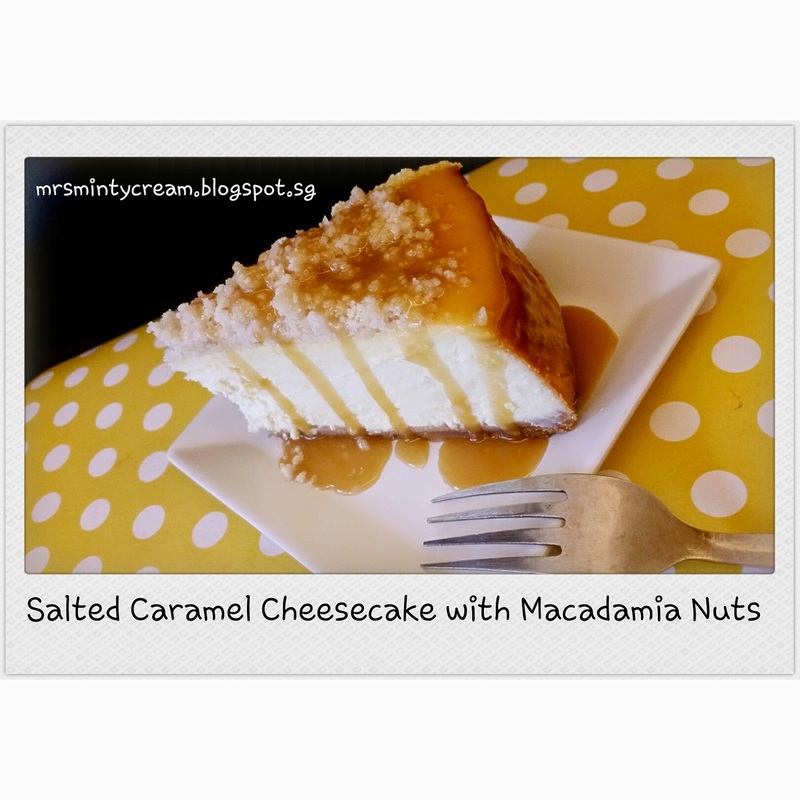 So, after our recent trip to Club Med Bintan, I decided to be nice to him and just let him indulge in the 1kg worth of cream cheese in this new recipe I have tried out - Salted Caramel Cheese with Macadamia Nuts. Compared to my previous recipe for Baked Cheesecake with Kiwi Topping, I did some minor changes to the proportion and it still taste as good as before! In my opinion, the magic was in the addition of the sour cream! 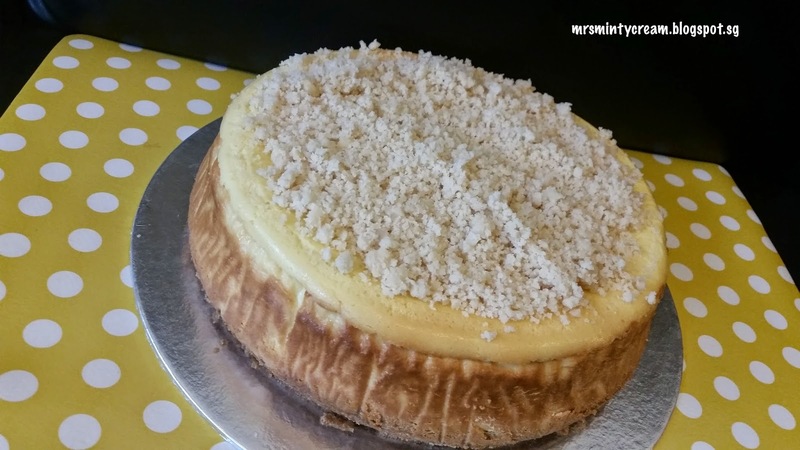 It really helps in giving the cheesecake a tangy taste to it. In fact, the Baked Cheesecake was looking really good when I got it out of the oven. And then, (I blame it on my own impatience) due to the fact that I did not leave it long enough in the oven to cool off before transferring it to tabletop to cool completely, it results in a horrible looking crack right at the centre of the cheesecake. So indeed, patience is a virtue. Lesson learned. 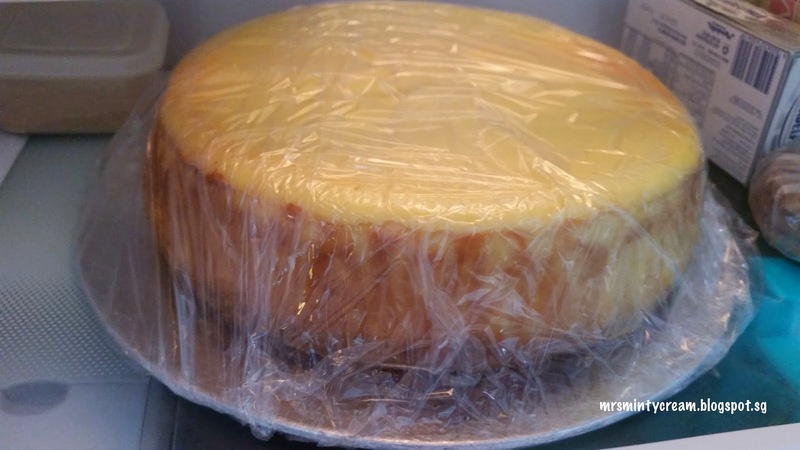 What I did next was to quickly fix the crack on the cheesecake with help from the following YouTube video, before sending it to the fridge to be cooled further. After staying in the fridge for 6 hours, the cheesecake turned out really well! 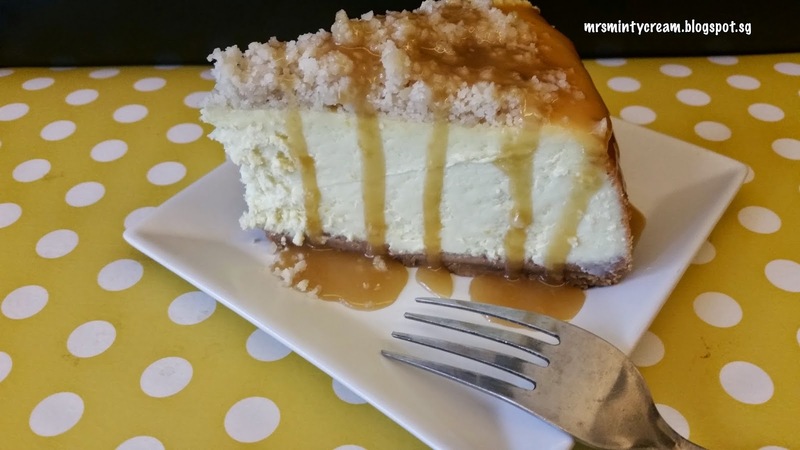 To top it off, I crushed some macadamia cuts and sprinkle them over the top of the cheesecake before drizzling the cake with some salted caramel sauce. Yummy! 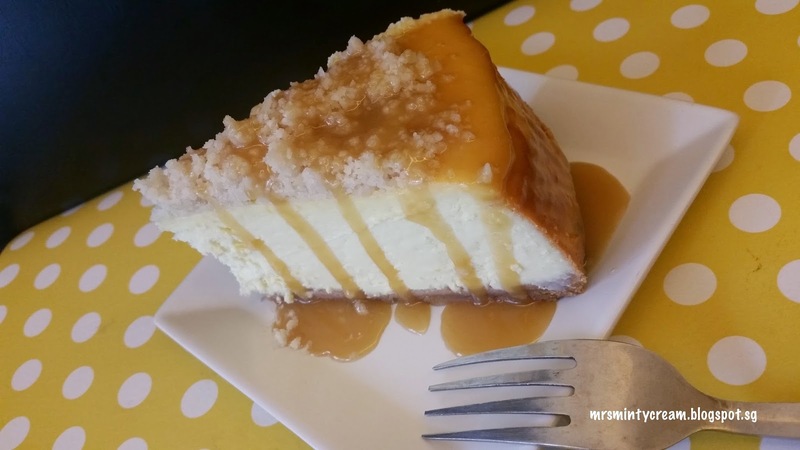 The cake was creamy, yet tangy and the caramel sauce was sweet yet salty. 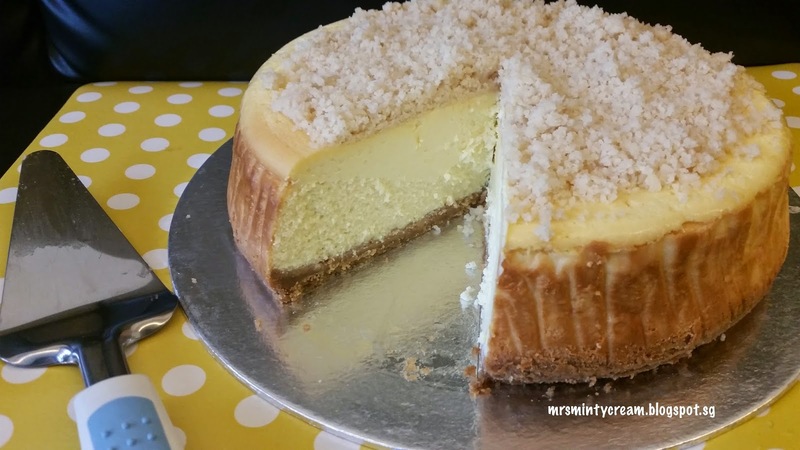 Not to mention, my hubby is in love with the buttery biscuit base of the cheesecake and me, with the nutty macadamia nuts topping. 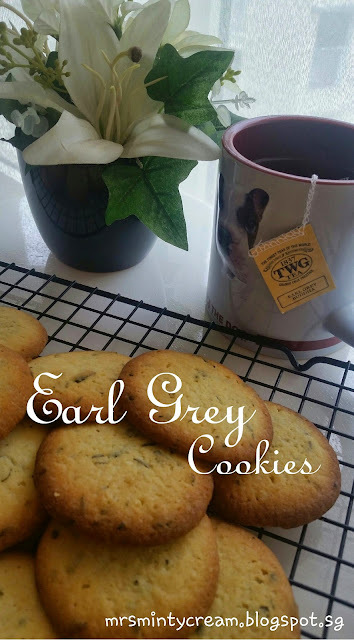 Go give this recipe a try and share it with me! 1. Preheat oven to 160 deg C.
2. Grease baking pan (Medium spring form cake pan, diameter 23cm) by spraying a layer of non-stick spray around the base and side of pan before lining the base and side with baking paper. Also line the base with aluminium foil on the outside. Set aside for later use. 3. To prepare the digestive biscuits crumbs for base & macadamia nuts for topping, you may either break up the biscuits / nuts into crumbs using a food processor or place them in a zip lock bag and break them up to crumbs by rolling a rolling pin over them in the bag. Set aside the crushed biscuits and macadamia nuts separately for later use. 4. Add in the melted butter to the crushed biscuits and mix well. The mixture should look like wet sand. 5. Pour the biscuit mixture into cake pan and pressed it firmly and evenly in the pan. I make use of the base of a ramekin to help me achieve an even layer. Bake for 8 minutes in the centre of the oven and set aside while making the cheesecake filling. 1. Using a mixer, cream the cream cheese with sugar to ensure a good mix. Add eggs, sour cream, flour, salt and vanilla extract into the mixture and mix until smooth. 2. Add in the lemon zest and lemon juice to the mixture and mix well. Once there are no more lumps in the mixture, you may stop mixing. Do not over mix so as to prevent cracks on the cheesecake. 3. Pour the cream cheese mixture over the biscuit base. Shake / tap the cake pan on the tabletop lightly so as to ensure that the filling is evenly spread and any air pockets within the mixture are removed. 4. Bake in the oven for 1 hour. 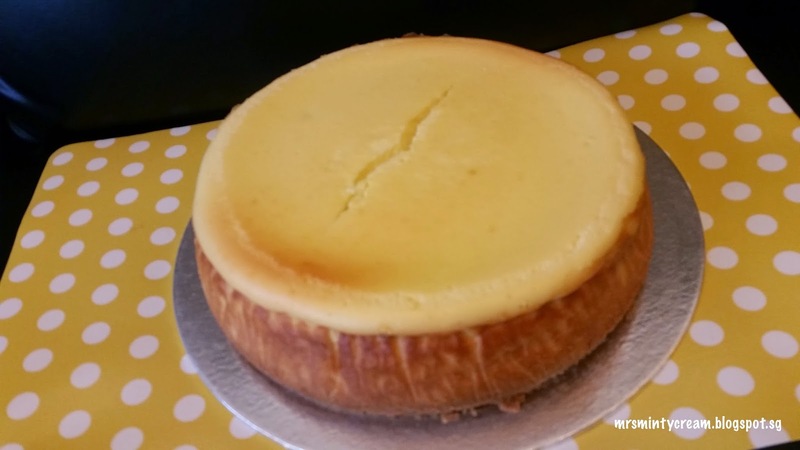 Leave the cheesecake in the oven to cool for an hour with the door ajar. 5. Remove from the oven and cool it completely on table top (I cooled it for 6 hours) before transferring the cheesecake to the fridge to chill for at least 4 hours. 1. 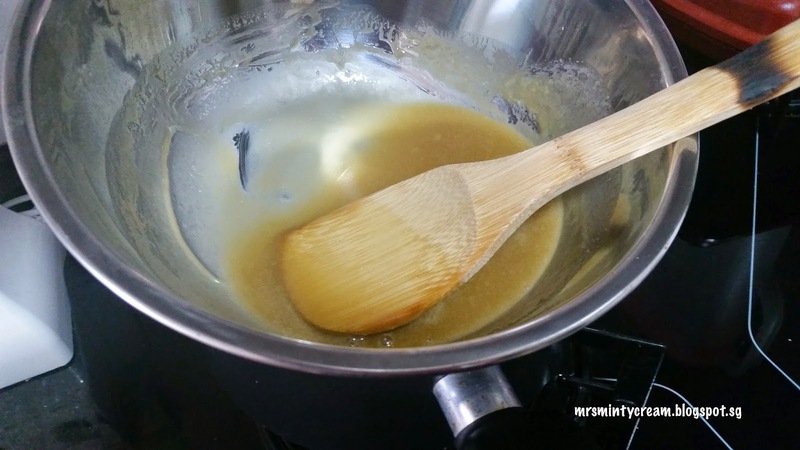 Using the double boiler method, heat up the brown sugar, heavy cream, unsalted butter, vanilla extract and salt. Keep stirring until the brown sugar is completely dissolved. The mixture should be gooey. 2. 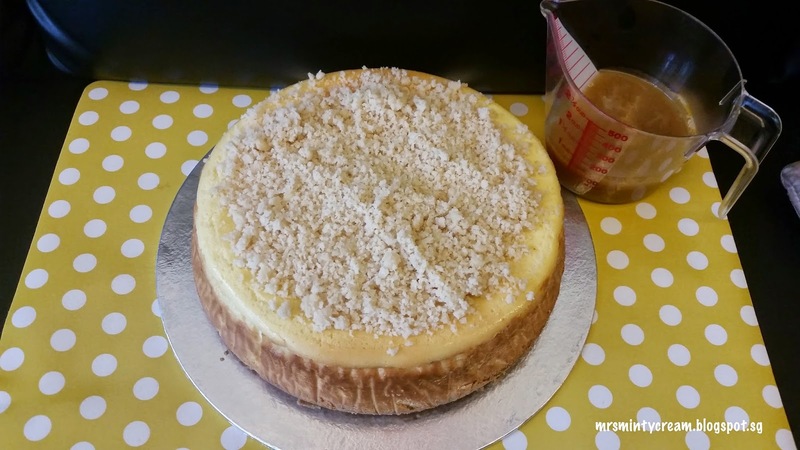 Before serving, sprinkle the top of the cheesecake with the crushed macadamia nuts and drizzle each slice of the cheesecake with the salted caramel sauce.